The Pizza Files: The Binge Part 3, unplanned Bonus. Stop 3, The 2009 Pizza Files Summer Binge gets an unplanned Bonus! The Crew of Pizza eaters from Part 2 said "We're going to Frank and Helen's on Sunday, they have pizza, you want to go?" It was a no-brainer. So today's Pizza came from Frank and Helen's Pizzeria in University City, MO. 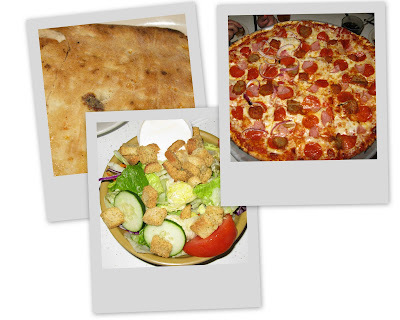 On the menu today was a House Salad with the House dressing, large thin crust pizza with Pepperoni, Canadian Bacon, Meatballs and Red Onions. Let me just say I was very impressed. Oh, there was some Broasted Chicken on the table also. It will take a few days to put my thoughts together on Frank and Helen's as I'm still working on Part 2. I'll get it done because next weekend I will be eating pizza in Columbia, MO at least twice.